I’ve always been a huge fan of the Google Summer of Code program, having been involved with it in many capacities over the years. The 2019 iteration of GSoC has been formally announced and the student application period starts soon. Please contact us at gsoc-support@google.com if you have any questions. Telegram is one of my favorite chat applications – it provides security, super speed, and a myriad of other features that you don’t find in almost any other chat service. Another such service is their Bot framework, which allows the creation of chat bots for Telegram that can do so many different things. Some of these are bots for services such as Gitlab and Bitbucket, which work off of webhooks to send commit details for repositories to a given chat on Telegram. Amazon Web Services’ CodeCommit is a managed version control service provided by AWS, which can be configured to use Git as its underlying platform. When using CodeCommit, I wanted to send notifications on new commits to a Telegram group similarly to what the aforementioned bots for Gitlab and Bitbucket do. So I set out to achieve this using triggers from CodeCommit, a Lambda function and a very simple Telegram bot. As seen above, I created a Lambda function which is triggered by specific events on the CodeCommit repository, which contains the code needed to send a RESTful GET request to the Telegram Bot API to send a message to a specific group using the Telegram Bot. NOTE: While @BotFather insists that it may come back some day to me with a request of its own, it has not done so yet, so I’m hoping I won’t be finding any severed horse heads on my bed anytime soon. I wanted to send my messages to a specific Telegram group so I used @RawDataBot to get the group ID of that group, which is basically the group where the team members who work on this particular code repository are. @RawDataBot will give you a massive JSON string as soon as it joins the group, in which the chat ID will be included. In the code above, I’ve used the aws-sdk npm package to extract the CodeCommit JS API, which can be used to extract things such as commit details from the minimal information that is provided to you by the CodeCommit trigger. Actually, all you can get out of the CodeCommit trigger (the event object that is passed to the Lambda function) is the Ref of the repository that the commit occurred on and the commit ID. And well, that’s how it’s done. The full code can be found on Github. A huge shout out to Ashantha Lahiru who worked really hard to make the code presentable and more generic, as well as the MongoDB integration. Blazemeter is an awesome wrapper for JMeter that allows you to run JMeter load tests from various locations and generate awesome reports. One of the coolest features of Blazemeter is that it allows you to upload existing JMeter Test Suites in the form of JMX files to execute those tests with any load that you specify. However, I found that startup itself was failing on Blazemeter when I uploaded a JMX file generated by JMeter 3.1. Upon consulting the helpful support team, I was told that their compatibility with JMeter 3.1 is experimental, and I should remove a bunch of listeners I had added for reporting from the JMeter file. This solved the problem, and I was able to run my tests. Now this isn’t necessarily a post on programming, but I’m so excited about this new game that I just had to post somewhere. As an ardent fan of Ingress, I was very excited when they announced that Niantic Labs who built Ingress would be taking one of my favorite franchises, Pokémon, and building an AR game based on the same principles. The game follows the same premise as the beloved games from GameFreak; there’s a Professor who gives you a started Pokémon (Squirtle, Charmander or Bulbusaur) and sends you on your way to catch Pokémon all around the world. That’s where the similarities end. You find yourself in an AR world based on Google Maps and very heavily on the locations tagged as portals in Ingress: Some of them are Gyms (You can’t do anything at a gym until you’re Level 5 as a trainer; I’m still Level 4 so don’t know what’ll happen here), and the others are Pokestops, which follow the hacking mechanism in Ingress and give you items when you’re in range; although the item spawn doesn’t seem to be randomized like in Ingress: the Pokestop next to me right now just gives 3 Some Ingress portals are Gyms, others are Pokestops which follow the hack mechanism in Ingress and give items (the item spawn doesn’t seem to be randomized though, the Pokestop right next to me seems to only give 3 Poké Balls). I really like the idea of this AR game, and the fact that it gets you out of the house to play it. You get some exercise in the meantime! That really benefits me since I try to exercise when I can, as well as watch what I eat. I even take a natural health supplement that is very effective, and I highly recommend it. If you would like to check it out for yourself, you can go here for more information. Evolving my Pidgey seemed to give it new moves but did not improve its stats, which was rather disappointing. CP, or Combat Points, seem to be needed for battles as explained here. I can’t battle until I’m Level 5 though, so I don’t know yet. Catching a Pokémon is pretty exciting, it turns on the camera and shows the Pokémon on screen where you have to throw Poké Balls at it by flicking balls towards them. You can actually miss: I ended up throwing about 10 Poké Balls at a pesky Zubat. Like in the console games, you can use Incense to attract Pokémon to where you are; this didn’t seem as effective as the incense in the console games tho, I only got two extra Pokémon and the spawn rate doesn’t seem to get increased much. And that wraps up my first impressions on the game. Will post more once I can actually get in to a battle with someone. Until then, Gotta Catch ’em All!!! Cloudant is a recently-popular solution for cloud-based NoSQL databases. It is based heavily on CouchDB, and provides a very easy-to-use HTTP verb-based web service interface to carry out database operations. And simple as that, you can execute any complex query that works on Cloudant Query using the Cloudant npm package. It has been a hectic few months as a Google Summer of Code student for 2015 for Moodle, and it has come to a successful conclusion. It was my greatest pleasure to work on Moodle throughout this period, to get to know and respect my awesome mentor, Dan Marsden, to learn about how Moodle and its community functions, and to eventually be able to help that community with a successfully completed GSoC project. 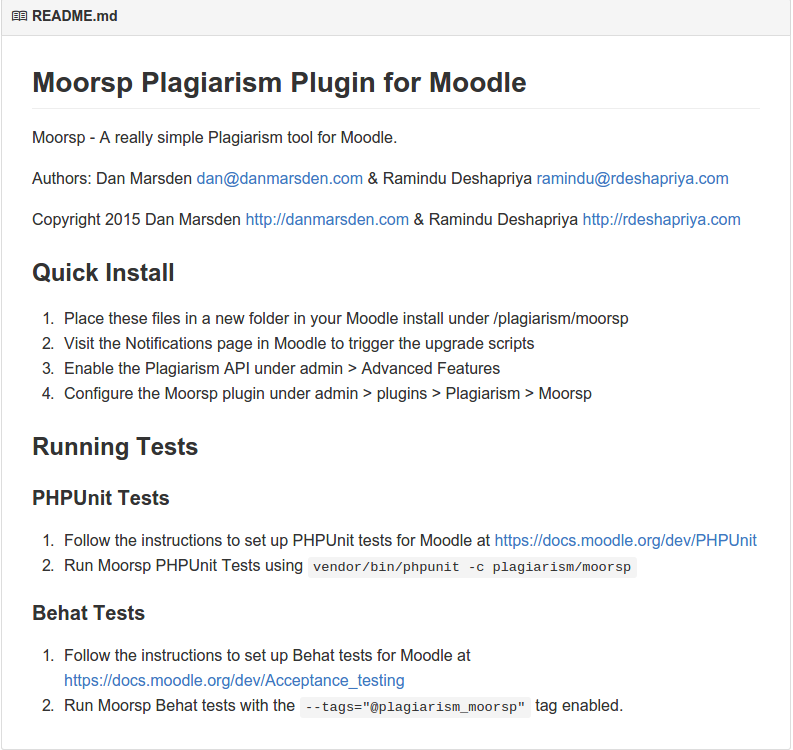 I set out to develop a skeleton plugin known as Moorsp for Moodle’s Plagiarism Framework, to incorporate the latest and greatest of Moodle’s framework goals within a testable plugin that wouldn’t need commercial logins to run automated tests. At the end of the project, all my code has been successfully integrated in to the Moorsp base code , and I have been awarded a pass by the Moodle community, both in terms of my contribution in code and community engagement. This makes me extremely happy. I hope to continue my work on Moodle and have already started to help Dan with integrating some of the newer concepts in the Moodle framework in to some of the older plagiarism plugins such as the Urkund Plagiarism Plugin which is maintained by Dan himself. I believe that the most important part of me doing a GSoC project is gaining the ability to integrate and work closely with the Moodle community, an opportunity which I absolutely will not let go to waste. Finally, I will leave you with the lovely Moodle GSoC 2015 Student Badge awarded to me by moodle.org. Thank you, Moodle, for this lovely token of appreciation. I shall always cherish it. This is my first update on the project in 2 weeks – mainly due to the fact that I have completed the bulk of the work required for the project and am now engaged in minor documentation and bug fixing tasks. I brought the PHPUnit tests up-to-speed to be compatible with some of the changes I introduced to Moorsp during the Behat test writing phase – most notably that of a div being loaded along with submission content in the assignment module. I had a discussion with Dan, my mentor, regarding sending a pull request to the main repository for Moorsp, and wish to merge the 44 extra commits listed here. I also updated the README.md on the repository to give a guideline on Behat testing and unit testing Moorsp. 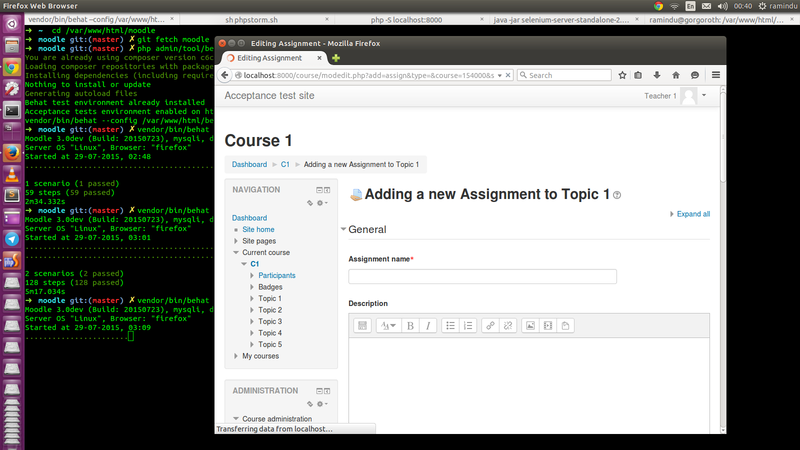 The 10th week of my GSoC project for Moodle passed with me writing more Behat tests for the Moorsp plugin, completing the Behat test writing phase of development. During writing tests I found some interesting bugs that were present in the code of Moorsp, most notable being that in onlinetext submission in the assign plugin, the content to be evaluated for plagiarism was being returned with <div class=”no-overflow”> tags around them, causing the filehashes to be mismatched and those text submissions not to be evaluated. I managed to build a workaround for this by hashing the contents with the offending tags included for onlinetext submissions. Behat tests are running smoothly, with the main Behat tests implemented here. The past week was spent continuing writing Behat tests for the Moorsp plugin. During writing the test for the feature where students are shown the plagiarism status on their submissions, I discovered that students were not being shown their plagiarism status even if the course manager had set a particular assignment, workshop or forum to show students this information. So I was able to fix this issue thanks to writing tests.